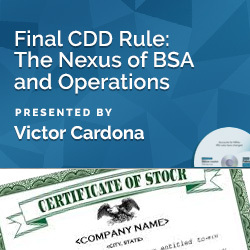 The impending Final CDD Rule breaks out parts of the BSA into the new 5th Pillar. Many of the requirements of the Final CDD Rule are already being practiced in theory by financial institutions, while other financial institutions are grappling with implementing new procedures to meet the new requirements. Pushback for more "BSA stuff" from the frontline is a common hurdle for BSA officers. However, much of the information that is already being collected as part of the Customer Identification Program (CIP) and Know Your Client (KYC) process can be leveraged to meet the new requirements, but additional process will still need to be implemented and reevaluated to ensure ongoing compliance. About the Speaker: Victor is currently Vice President of the BSA Department at Opus Bank, a $7.5 billion bank headquartered in Irvine, Ca. Victor has been in banking since 2004, specializing in BSA/AML compliance since 2005. 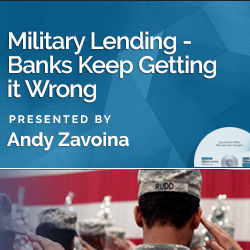 In 2015 and 2016, Victor served on the faculty of the BankersOnline BSA/AML Top Gun Conferences. This program was recorded in its entirety in December 2017. The CD-ROM includes program slides, materials (if available) and follow-up Q & A document.